The Leningrad Hermitage, whose artistic collections reflect the history of human culture from the primitive stage till our time, can rightly be called a treasure-house of world art. Founded in 1764, the Museum has been steadily growing since then, particularly fast after the October Revolution. Among its two and a half million exhibits - paintings, sculptures, graphic sheets, objects of applied art, medals and coins, armour and archaeological finds - there are many works produced by Russian artists and handicraftsmen. All they are gathered in the Department of the History of Russian Culture. Here, along with recognized masterpieces, one can see works which are not very well known even to specialists, let alone the lay visitors. This department, the youngest in the Museum, was established in 1941. Its creation was necessitated by the people's growing interest in the history and cultural heritage of their country. The Hermitage was thought to be the best place for such a department, as it was here that one could study the history of Russian culture in its relationship with the cultures of peoples living in the Soviet Union as well as with many other national cultures of the East and the West. The very rooms of the Museum (now it occupies five buildings, including the Winter Palace), their furnishings and decor provide good testimony to the talent and skill of Russian and foreign architects, artists and decorators. Many things here are connected with the landmarks of Russian political, social and cultural life. The permanent exposition in-cludes the Gallery of the War of 1812, which was built in commemoration of the Russian army's victory over Napoleon, the Malachite Room, which from June, 1917, served as the conference hall for the counterrevolutionary Provisional Government, and the Small Dining Room, where on the night of October 25-26 (November 7-8) its members were arrested by the Revolutionary Military Committee of the Petrograd Soviet of Workers' and Soldiers' Deputies. 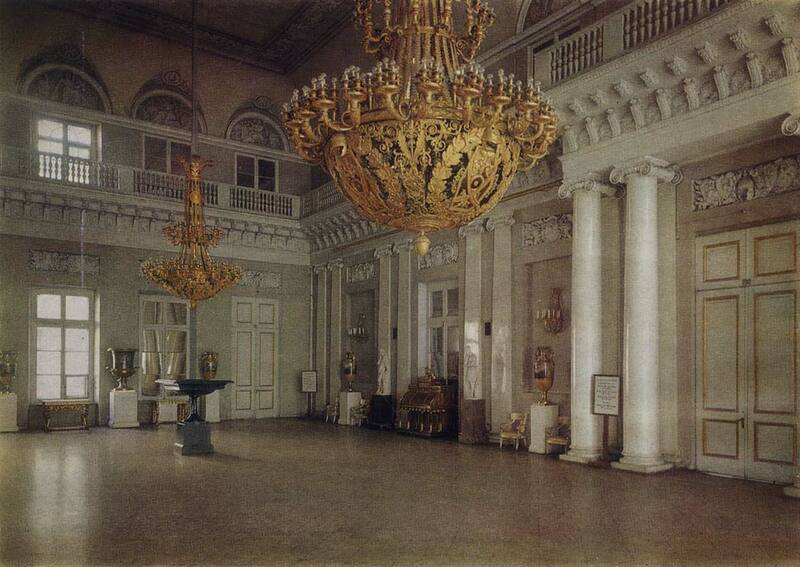 The present department is descended from a section of the Russian Museum, which it set up in 1918. Its rich collections of historical relics and household objects were housed at first in the museum halls and later in the Bobrinsky Palace. They were gradually augmented by the transfer of artistically valuable works from nationalized private collections (Stroganov's, Shuvalov's, Yusupov's, Kurakin's, Golitsyn's, Bobrinsky's, etc.) as well as antiquities and objects of applied art collected by I. Galnbek, F. Pliushkin and E. Schwartz. In the mid-1920s the museum opened its branches in the Menshikov Palace, the Summer Palace of Peter I, the Museum of Household Objects (it was opened in 1918, in the Fontanny House). By the beginning of the 1930s the section had in its possession numerous productions of the Russian applied arts. These works had been handed over from the Hermitage, some other museums and the USSR Museum Reserve Fund. An acquisition of special importance was made in May, 1930. These were items formerly exhibited at the Gallery of Peter the Great, an oldest collection which originated during the lifetime of Peter I. In 1934, after reorganization in the Russian Museum, the section was transferred to the Leningrad Museum of the Revolution (the Winter Palace) and three years later all its collections were handed over to the Museum of Ethnology of the USSR Peoples. (In the list of works reproduced in the album the provenance of things is given as "1941. The Museum of Ethnology" unless there is documentary evidence that they had earlier belonged to other museums and/or private collections.) The museum's historical section, which took charge of these materials, was soon closed, and in 1941 they were transferred to the Hermitage. Together with the thousands of precious monuments of Russian culture and art which had long been in the possession of the Hermitage and the Winter Palace they formed the basis of the now existing Department. Soon the Department received a unique collection of scientific devices and instruments which had formerly belonged to the Institute of the History of Science and Technology, the USSR Academy of Sciences. After that more than 6000 military banners were sent in from the Museum of Artillery. The Leningrad Museum of the Revolution shared with the Department its vast illustrative and documentary materials pertaining to revo-lutionary movements in Russia (mostly to the period of the Decembrist uprising). In the subsequent years the Department was considerably enriched due to archaeological excavations which have been carried on since 1951. Its collections were also enlarged by relics of old Russian culture and works of popular art which were found in the northern and central regions of Russia by special expeditions. Many of its exhibits have been acquired by the Hermitage Expert Commission, others were received as donations. One of the most important bequests - more than one hundred valuable glass and silver objects dating from the eighteenth and nineteenth centuries - was made by the associate member of the USSR Academy of Medical Sciences, S. Pavlov. Old Russian manuscripts, icons and household objects of the eighteenth century, received in 1977, were a gift of the Rozanov family from Nizhni Tagil. of Russian origin (weapons, coins and medals, works in stone, archaeological materials, etc.) are kept in other departments, although the Department of the History of Russian Culture uses them for research purposes and in displays. This scheme of distribution reflects some historical peculiarities in the formation and storage of the Hermitage collections. ), represent the development of the national culture from the sixth century onwards. Chronologically the material is divided into two large parts: the first, including old Russian monuments from the earliest time till the end of the seventeenth century, and the second, covering the period between the 1700s and the 1900s. Rich and varied materials, mostly archaeological, illustrate the culture of Ancient Rus and Muscovy. Particularly noteworthy here are the selections of things discovered in Kiev on the sites of the Desiatinnaya Church and St Michael Gold-topped Monastery, artifacts from Novgorod excavations, objects found on the Raikovetsky site in the region of the old town Iziaslavl. Archaeological excavations in Pskov, carried on by the Department since 1958, have given valuable material on the life and culture of this old town. The recent discoveries included frescoes which, as specialists believe, may have been painted in the midfourteenth century. Besides them the Department owns rare specimens of the early twelfth century ornamental painting from Kiev, a number of fragments of the twelfth and early thirteenth century murals unearthed in 1962-63 on the site of the Smolensk Church "on Protoka", etc. The collection of Russian icons, totalling about 1000 boards, includes very good productions of the thirteenth to the seventeenth centuries. Of special interest are some rare examples of Northern icons. Old Russian applied arts are represented by a limited number of works, some of which, however, are quite important. Among these are rare samples of fifteenth century embroidery, items made of gold and silver, inlaid with niello, embossed and engraved, ornamented with precious stones and enamelled. There are many utility things notable for artistry of execution: cover plates, caskets, lanterns, dishes of tin and copper, etc. Special mention should be made of seventeenth century products of Solvychegodsk masters - the socalled Usolye enamels. Important additions have been made recently to the collection of manuscripts and incunabula. The gems of the collection are a fifteenth century Book of Gospels with miniatures and head-pieces, a rare manuscript of 1672 - The Book of Titles and several books produced by the first Russian printer Ivan Fiodorov. Rich and varied are collections illustrating the development of Russian culture in the eighteenth and nineteenth centuries. Along with paintings, sculptures, drawings and prints, the Department has on display numerous products of applied arts: pottery, metalwork, fabrics, costumes, furniture, carved stone. The collection of Russian paintings, about 3000 canvases, differs from collections of this kind in other leading museums in the way the pictures are selected according to themes and genres. Portraits of Russian statesmen, scientists, military leaders, artists are interesting from historical and cultural points of view. The same applies to "informal" portraits, representing people of different social groups. 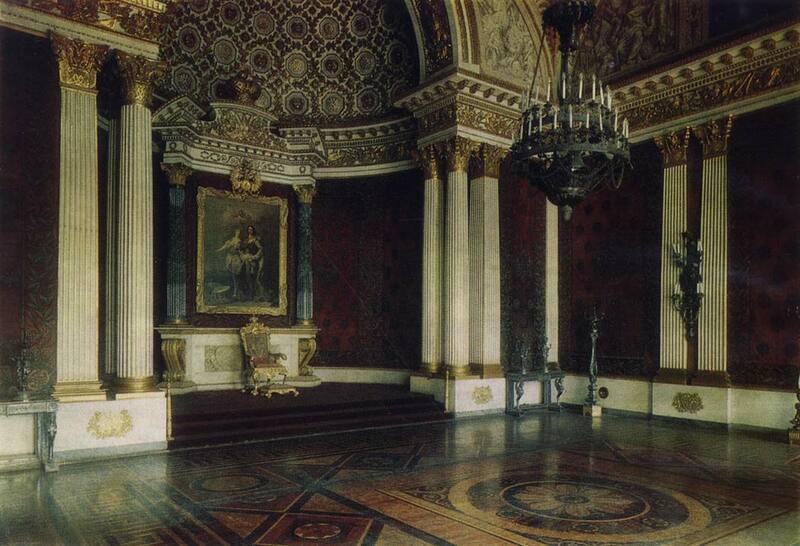 Noteworthy is the series of palace interiors decorated with paintings by some pupils of Alexei Venetsi-anov. Among the pictures are battle-pieces with the subjects taken from the Russian military history, and landscapes. Side by side with anonymous works the exposition includes pictures by Ivan Nikitin, Ivan Argunov, Vladimir Borovikovsky, Dmitry Levitsky, Karl Briullov, Alexei Venetsianov, Vasily Tropinin, Nikolai Gay, and other eminent Russian painters. In the graphic section on view and in storage there are about 8 000 drawings and watercolours. These are mainly portraits, views of estates and manor houses, genre scenes and interiors. Quite unique is the collection containing rare portraits of Decembrists and views of the places in Siberia where they spent their terms of imprisonment or lived in exile. Some of these drawings and water-colours are works of Decembrists - N. Bestuzhev, A. Muravyov, N. Repin, I. Kireyev and others. The picturesque views of town and country residences are complemented by a selection of water-colours representing towns and localities of Russia. A number of architectural plans and drawings illustrate the activities of the well-known architects Vasily Bazhenov, Ivan Starov, Nikolai Lvov. Some of them were done by Giacomo Quarenghi, Charles Cameron, Antonio Rinaldi and other foreign architects who for many years lived and worked in Russia. The section has graphic works by Sylvestre Shchedrin, E. Martynov, Fiodor Alexeyev, C. Beggrow, Alexander Orlovsky, Orest Kiprensky, Vasily Sadovnikov, S. Vorobyov. The vast and varied collection of prints comprising engravings and lithographs produced between the eighteenth and the early twentieth century is second to no other collection of this kind in the country. Among its oldest exhibits are prints which from the eighteenth century were kept in the Hermitage Engraving Room. The section has considerably grown during the Soviet period, and now it has in storage more than 35 000 sheets by Russian artists. In addition it owns about 40 000 prints representing military uniforms of all countries, including Russia. These collections give a good idea of what has been done by Russian engravers over two and a half centuries. In the collection of sculpture, rather modest in size, we find works by the leading sculptors of their time - Fiodor Shubin, Mikhail Kozlovsky, Boris Orlovsky, Fiodor Tolstoi, Vasily Demuth-Malinovsky. The notable features of the exposition are rare monuments of the 1720s exemplifying the renovation of the Russian plastic art. Along with statues by Bartolommeo Rastrelli one finds here a great number of copper and bronze bas-reliefs produced in the workshop of A. Nartov. Notably rich and complete are the sections devoted to various applied arts. In the vast collection of Russian ceramics (over 11000 items) the largest part belongs to porcelain. The excellent products of the Lomonosov (formerly Imperial) Porcelain Factory include some very old specimens reminding of the name of Dmitry Vinogradov, the pioneer of porcelainmaking in Russia. Side by side with china from the private factories of Gardner, Popov, Miklashevsky there are vessels produced by the first Soviet porcelain-makers: N. and E. Dan-ko, Z. Kobyletskaya, A. Shchekatikhina-Pototskaya and some articles designed by the artist Sergei Chekhonin. The collection of Russian fancy glass (over 3 000 pieces) comprises early works of the Izmailovo and Jamburg factories dating from the late seventeenth and the early eighteenth centuries. High artistic quality marks the production of the St. Petersburg Glass Works founded in the 1730s. Elegant and original glassware was produced in the nineteenth and the early twentieth centuries by some private enterprises, including the factories of Maltsev and Bakhmetyev. The production of silversmiths, goldsmiths and lapidaries in the period between the end of the seventeenth and the beginning of the twentieth century is represented by more than 10 000 items. Silver articles produced in St. Petersburg, Moscow, Vologda, Tobolsk, Yaroslavl, Novgorod reflect both the local peculiarities and stylistic changes which occurred during this period. Many of these things bear the names of well-known masters, Russian and foreign: P. Semionov, P. Grigoryev, N. Don, I. Artemyev, J.Lund, V. Sorkovanov, Z. Deichmann and many others. Among the exhibits is an excellent example of the Russian baroque - the silver sepulchre of Alexander Nevsky(1747-52). It is a production of the St. Petersburg Mint. The silver for its construction was received from the Altai mines. The Department has in its possession about 500 enamels, most of them products of Veliky Ustiug. The collection includes some very rare articles from the Popovs factory (it worked only fifteen years: from 1761 till 1776). Among the products of the nineteenth and the early twentieth century we find works by such well-known masters as Sazikov, Ovchinnikov, Grachov, Semionov. There are also things produced by the famous firm of Carl Faberge. 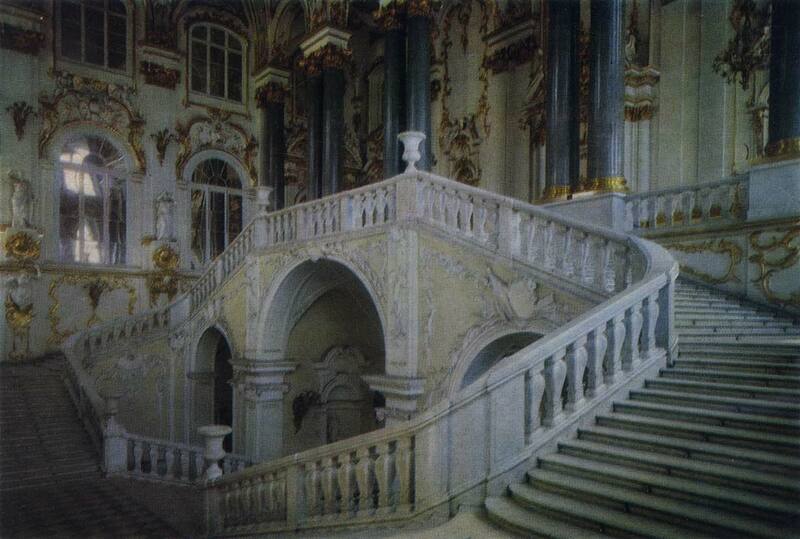 A collection which the Hermitage is particularly proud of is that of steelwork of Tula craftsmen. The total number of their works now in the possession of Soviet, English, French and other museums is 500. The Hermitage collection, counting 300 items, includes some very rare and precious specimens, among them works signed by R. Leontyev, E. Guryanov, A. Sukhanov. The Hermitage, which is often called a treasury of the Russian lapidary art, owns numerous and diverse articles cut in colour stone. On show there are decorative vases, floor lamps, stone-topped tables, bowls, obelisks and other objects representing the production of the Peterhof, Kolyvan and Ekaterinburg lapidary factories. Many prizes at world exhibitions have been won by works of the leading stone-carvers S. Morin, the Nalimov, the Kokovkin, etc. During the last twenty years the Department has considerably enlarged its collections of folk handicraft production. For this purpose it has annually sent expeditions to different parts of the Soviet Union. Now in the exposition we find many specimens of the art of Russian weavers, embroideresses, potters and wood-carvers. The traditional art of the Kholmogory bonecarvers is represented by 1 000 items, including very rare productions of O. Dudin, N. Vereshchagin, those signed with the monogram AD and many anonymous works. The collection of furniture, one of the largest in the country, consists of 12 000 pieces. It enables us to follow the work of the Russian cabinet-makers from the late seven-teenth to the early twentieth century. Among its exhibits are sets designed by the leading architects of their time - Charles Cameron, Giacomo Quarenghi, Carlo Rossi, Vasily Sta-sov, L. Rusca and those executed by the well-known St. Petersburg cabinet-makers - H. Meier, the Gambs, A. Tur, I. Starchikov, V. Bobkov and others. The collection of fabrics and costumes, more than 20 000 items, is remarkable for its artistic and historical value. Very interesting is the selection of costumes, ranging from the time of Peter I (late 17th century) to the 1920s. Some of the specimens of men's, women's and courtiers' dress, military uniform and folk costumes are now quite unique. Here we find garments designed by the leading Russian and foreign firms and well-known tailors: Ch. F. Worth, N. Lamanova, Paquin, Doucet, Brizac and others. The collection of costumes is complemented by various samples of Russian sixteenth to twentieth century weaving, lace, work in beads and bugles, women's head-dresses, scarfs and shawls. The most notable among these are the Kolokoltsov shawls, which were produced only in Russia but were known far beyond its confines. The Department owns tapestries and carpets, including some rare ones, produced in different years between the reign of Peter I and the twentieth century. Another unique collection is formed by Russian military banners of the seventeenth to the twentieth centuries and banners captured in battles. Their total number exceeds 6 500. Most valuable is the collection of scientific tools and instruments (about 1 500 items). Here one can see sundials and stellar time-pieces, drawing instruments and telescopes, artillery, navigational, geodetic and other instruments which were in use between the seventeenth and the nineteenth centuries. Turning lathes, the work of A. Nartov and his pupils, deserve special notice. 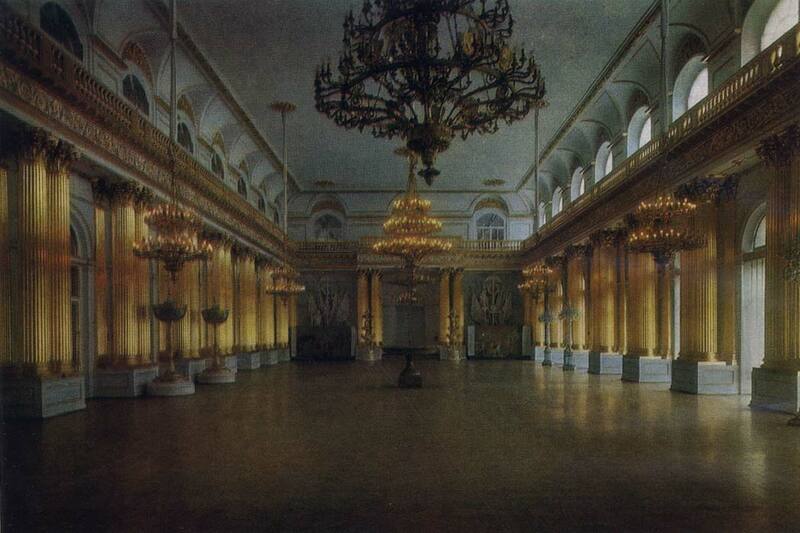 Once they were installed in the famous Turnery of Peter the Great. This national heritage is being carefully studied and classified. The results of extensive research carried on by the Department are presented in books, articles and catalogues. The publications of the last twenty years include the comprehensive Catalogue of Monuments of Russian Culture. 1700-25 with more than 3 000 entries; several large albums on Russian furniture, tapestry, porcelain, Tula steelwork, silverware, etc. In preparation are monographs devoted to book production in Ancient Rus, the "hanging seals" of the fifteenth and sixteenth century found during excavations in Pskov, to the folk art of the Russian North, etc. Much attention is being given to preservation of these artistic and cultural treasures. The Museum has several workshops which specialize in conserving and restoring various kinds of monuments. They sometimes give a new lease of life to things which seemed to be on the very brink of ruin. Some of the reproductions in this album give visual proof of the masterly work of restorers. An important aspect in the Department's activities is preparation of exhibitions. The principles of this work can be summed up as follows: to show, on characteristic and vivid examples, what has been achieved by the Russian people in the fields of art, architecture, literature, education, science and technical invention; to present the material in a complex so as to demonstrate the interrelation between different cultural processes in the course of historical development. With an exposition consisting of several complementary parts, the Department is able to give a more comprehensive picture of Russian cultural and artistic achievement than anything that can be offered by specialized museums. Here are some of the exhibitions now on in its rooms: Culture of the Ancient Rus (6th-15th century), of Muscovy (15th-17th century), the time of Peter I, the middle and the latter half of the 18th century, the period between 1800 and 1860. In addition to this the Department regularly mounts temporary exhibitions. Some of them are timed for different anniversaries (250 years of the Academy of Sciences; 250 and 275 years of St. Petersburg; bicentenary of the birth of Carlo Rossi) others feature individual categories of artistic work: Russian porcelain, Russian fancy glass, applied art of the seventeenth century, lighting devices in Russia from the 17th to the 20th century, Russian samovars, book production in the 15th-17th centuries. Such exhibitions enable the visitors of the Department to see a greater part of its material and become more fully acquainted with some aspects of the Russian cultural heritage. Travelling exhibitions organized by the Department have been seen in different cities of the Soviet Union. Thus, The Russian Graphic Art was shown in Novgorod, The Russian Applied Art of the 18th-20th Centuries - in Zaporozhye, Izmail, Odessa, Azov, Taganrog, Murmansk, The Tula Craftsmen - in Tula. Many of the Department's exhibits travelled with the Hermitage loan exhibitions to Paris, Tokyo, Helsinki, Budapest, Belgrade, Dresden and other foreign cities. During a year the exhibition Russian Costume in the 17th-20th Centuries was open in New York (1977). In 1966 the exhibition Russian Graphic Art in the 18th-20th Centuries made a tour of Yugoslavia. Every year the Department of the History of Russian Culture makes new additions to its collections. The expositions become more extensive. Growing attendance figures bear witness to people's unabated interest in the artistic and cultural legacy of their country.